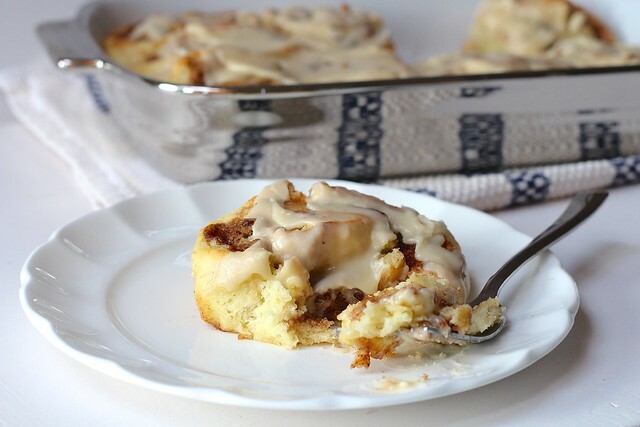 Cookie dough stuffed cinnamon rolls, need I say more? 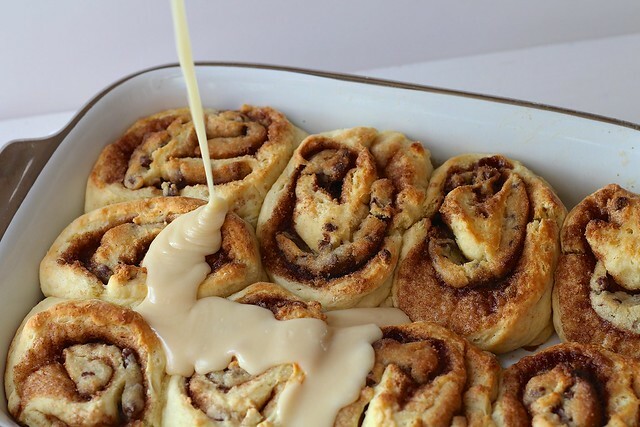 These are cinnamon rolls taken to the next level. Egg-free, raw cookie dough in cinnamon rolls? Totally brilliant. These were divine. I think I may have eaten most of the pan by myself. I can't resist cookie dough goodies. I used my favorite quick dough for the cinnamon rolls, so no waiting all day for the rising times. Inside the rolls there is an easy, egg-free cookie dough, as well as a healthy coating of cinnamon. Then, the dough is rolled up with all the amazingness inside, sliced and baked to perfection. To finish the rolls off, a delicious brown sugar glaze is drizzled over the top. Ohmygawd. And yes, I like to make up descriptive words. I feel like I can get my point across better. These would be a wonderful Christmas morning treat. Or even to start as a tradition! If my husband shared my obsession of cookie dough, then these would totally become our tradition. But, sadly he doesn't. Of course, these would be delicious any ol' time of the year! Preheat the oven to 400ºF. Have a 9x13 inch baking pan with 2 inch sides ready. In a large bowl, whisk together the flour, sugar, baking powder, baking soda and salt. Using a pastry blender or two knives, cut the butter into the flour mixture until it has the consistency of coarse cornmeal. Stir in the buttermilk and vanilla extract until the dough begins to hold together. Do not overmix! Turn the dough out onto a very well floured surface and knead gently until the dough comes together. Roll or pat the dough into a rectangle that is 1/2 inch thick. To make the filling; In a small bowl, stir together 1/2 cup brown sugar and cinnamon. Set aside. In the bowl of an electric mixer, beat together 1/4 cup of the butter, granulated sugar, and the remaining 1/4 cup brown sugar, until light and fluffy, 2-3 minutes. Mix in the vanilla extract and milk. Stir in the flour and salt until fully incorporated. Stir in the chocolate chips. Set aside. Melt the remaining 2 Tablespoons of butter. Brush the butter over the rolled out dough, leaving 1/2-inch clear around the sides. Sprinkle the brown sugar and cinnamon mixture evenly over the surface. Place flattened pieces of cookie dough evenly over the top, making sure to leave the 1/2-inch edge clear. (This a wonderful task for a toddler in the house.) From the long side, roll the dough up jelly roll style to form a log. Pinch the outside edge together to seal. With a serrated knife, cut into 1 1/2-inch thick slices. Place on the prepared pan with just a little space between them. Place the pan in the preheated oven and bake until the rolls are lightly golden brown and firm to the touch, about 15-20 minutes. Remove from the oven and let cool. While the rolls are cooling, prepare the glaze. In a small saucepan, combine the heavy cream, brown sugar and butter over medium heat. Stir until the sugar is dissolved and the butter is melted. Remove from the heat and stir in the vanilla extract and confectioners' sugar. Drizzle the glaze over the warm rolls and serve immediately. Store any leftovers covered, in the refrigerator.